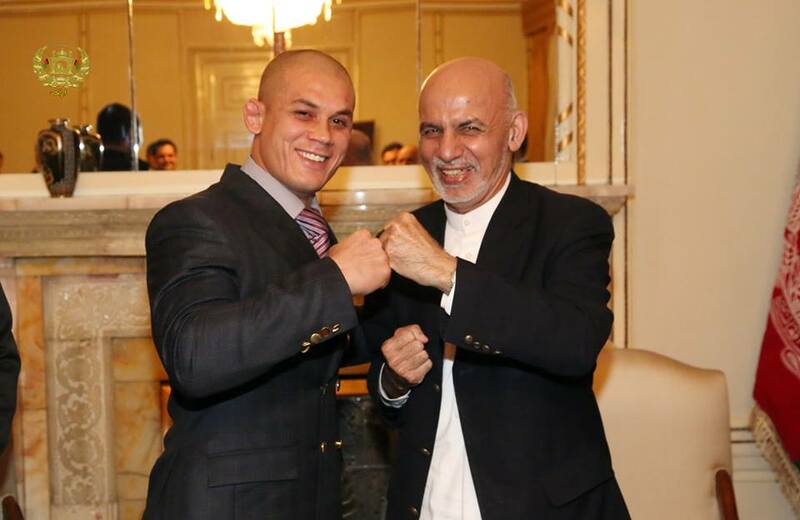 President Mohammad Ashraf Ghani has conferred high state medal on Mixed Martial Art (MMA) fighter Baz Mohammad Mubariz for his efforts and recent victory. The Office of the President in a statement said Mubariz has also received cash reward along with Mir Masjidi Khan high state medal for his last victory against his Russia rival. President Ghani hailed Mubariz and his team for their tireless efforts for hoisting the Afghan flag in a major international sports event. He said the Mixed Martial Arts (MMA) sport has gained fame among the people following the major sports such as cricket and football, insisting that more work should be done in MMA field in the country to develop the sport. Ghani also hailed the Afghan youths for the level of talent they have specifically in the field of sports and pledged further support of the government to help the Afghan athletes to have more achievements on international level. Mubariz is one of Afghanistan’s brightest Mixed Martial Arts stars – in a country far removed from the glitz and glamour of America’s UFC series. Also known as “the Eagle”, Mubariz started his pro career in India, where he went through a three-round battle with Kazakhstan prospect Kuat Khamitov. Mubariz is the first Afghan athlete to be elected to participate in Russian Mixed Martial Art fights after securing first place in “Striking Eagles” fighting contest, organized by Absolute Championship Berkut last year.